1. What is the Common Application Essay? 2. What is a Supplemental College Essay? Hello, you - whoever you are. It's possible that you're coming to this guide as a rising senior, just beginning to eyeball colleges. Or else, you might be the parent of a student who's soon approaching the process of applying to schools. Or, perhaps, you're a senior who, in a desperate bid to make up for months of procrastination, has turned to this guide looking for guidance in crafting your essay. No matter who you are, you're in luck - because contained in this super, mega, ultimate guide are all the secrets you could ever care to know about the college essay. In this guide (which is so long and mega that, above, I've included a table of contents for the sake of expediency) we cover topics from the basic (What is the Common App?) to the microscopic (How do I edit my own work? What topics are on and off the table?) and everything in between. Part One: The Very Basics - What is a College Essay? No matter which type you're writing, though, college application essays tend to place you, the writer, in the spotlight. They're designed to help admissions committees gain an insight into what makes you tick. Thus, college essay prompts are often (if not always) of a directly personal nature. They're written in a way so as to challenge the writer to dig deeply and to share personal information about such topics as one's family background, passions, intellectual predilections, or extracurricular occupations. In sum, the college essay is designed to triangulate who you are for an admissions committee . In very short, then, a good college essay is one in which the writer goes deep, exposing him- or herself on the page, while a bad essay is one that stays on the surface and never moves beyond (or, rather, beneath) the level of the superficial. If that all sounds abstract, don't worry - we'll go deep into detail on what this all means soon. For now, though, let's talk about the two primary types of college essay. I refer, of course, to the common app essay and to the dreaded supplemental essay. To answer this question, you first need to know what the Common Application (App) is. The Common App is a non-profit organization that is the main facilitator of applications to colleges in the United States. Practically speaking, the Common App is a giant portal that you, the applicant, will use to upload your essays, input your personal information, and select the schools to which you want to submit. Helpfully, the Common App aggregates most if not all of the information you need in order to make a successful application to a given school. The Common App is the place to go to figure out what prompts you'll need to respond to in order to satisfy the essay submissions requirements for a given school, and they're also in charge of determining which "common app essay" prompts students will be answering in a given year. Now, let's get back to the question at hand. The Common App Essay is a general essay that almost every school requires prospective students to submit. While some schools ask for additional supplementary essays (I won't get ahead of myself yet), the Common App Essay is required by almost every school. Completing the Common App Essay is the MINIMUM you will need to be a viable applicant. As I mentioned above, the essay is designed to help applicants share their personality with admissions panels. Here are the prompts for the current application cycle. These prompts, released in 2017, have remained unchanged since and, collectively, offer a wide variety of footholds for an applicant to tell his or her story. There's somethin' in here for everyone. "Some students have a background, identity, interest, or talent that is so meaningful they believe their application would be incomplete without it. If this sounds like you, then please share your story." "The lessons we take from obstacles we encounter can be fundamental to later success. Recount a time when you faced a challenge, setback, or failure. How did it affect you, and what did you learn from the experience?" "Reflect on a time when you questioned or challenged a belief or idea. What prompted your thinking? What was the outcome?" "Describe a problem you've solved or a problem you'd like to solve. It can be an intellectual challenge, a research query, an ethical dilemma - anything that is of personal importance, no matter the scale. Explain its significance to you and what steps you took or could be taken to identify a solution." "Discuss an accomplishment, event, or realization that sparked a period of personal growth and a new understanding of yourself or others." "Describe a topic, idea, or concept you find so engaging that it makes you lose all track of time. Why does it captivate you? What or who do you turn to when you want to learn more?" "Share an essay on any topic of your choice. It can be one you've already written, one that responds to a different prompt, or one of your own design." As you can see, these seven prompts are designed to provide a near-infinite number of possible responses. And if the first six don't do it for you, there's always prompt number 7, which is explicitly designed for anyone else. So, in sum, the Common App Essay is a universally required essay of between 250 and 650 words that, drawn from seven possible prompts, is the primary way that a university gauges your writing. The Common App Essay is designed to help highlight a student's individuality, and is an opportunity to "go deep" and share oneself with the admissions panel. Now, on to the supplementary essay. Unlike the Common App Essay, which is near-universally required by colleges, supplemental essays are provided on a case-by-case basis by the colleges themselves. Their parameters vary widely. Some are on the shorter side, clocking in at 100 words or fewer, while some rival the length of the Common App Essay at 500 words or more. The supplementary essay is generally intended as an opportunity for students to show why a specific school is the one for them. Prompt: "You’re on a voyage in the thirteenth century, sailing across the tempestuous seas. What if, suddenly, you fell off the edge of the Earth?" While the Common App Essay is designed by the Common App organization, supplemental essays are written by colleges and universities, so their prompts (and the kinds of responses they solicit) align more explicitly with the goals and priorities of a college. That is, the supplementary essay is a college's tool for screening applicants, sometimes (but not always) by providing challenging or confusing prompts. For example, check out the sidebar - that prompt is real, and really challenging. It's both an opportunity to be creative and is potentially impossible to answer . Supplemental Essays that Worked: Spotlight on Chicago prompt, "find x"
Above all else, the supplementary essay is critical for letting your favorite schools know why you'd like to attend them. Even in the most creative approach to the supplementary essay, it's good advice to keep one eye on the prize: that is, of giving a clear reason why you belong at X school, whether that school is the University of Oregon or Johns Hopkins. Now that we've clarified the two main types of essay, it's time to move onto a closer consideration of the actual essay topics themselves, and the possible responses we might imagine to some of them. Ok, so: we now know the difference between the Common App Essay and the supplemental essay. We also know the range of possibilities for the Common App Essay prompts. But what are some possible ways to successfully respond to the those prompts? Right up front, it's important to understand the breakdown of which prompts students choose to answer the most frequently. Why? Because, by understanding which prompts are more or less frequently chosen, you can get a sense of where you fit in the cavalcade of applications that admissions committees see every year. So, here's a breakdown of the three most common Common App prompts. According to the Common App, the most popular prompt in the 2017-2018 cycle was number (5), "Discuss an accomplishment, event, or realization that sparked a period of personal growth and a new understanding of yourself or others." A whopping 23.6% of students chose to answer this prompt. Second-most popular was prompt (7), a topic of personal choice, with 22.5% of students choosing to answer. The third most popular was prompt (1), "Some students have a background, identity, interest, or talent that is so meaningful they believe their application would be incomplete without it. If this sounds like you, then please share your story." 21.4% of students chose to answer this prompt. That means that, although there are seven (7) prompts to choose from, the majority of students (~70%) choose from among only three. One could draw several conclusions from this - that these prompts are the most compelling, perhaps; or else, that students find the other prompts more challenging, and thus avoid them because they're afraid of failing to answer the prompt in a satisfactory manner. Some students may see this as an opportunity to choose the less commonly answered prompt, and thus to stand out in the eyes of an admissions committee. All this aside, it's time to examine the question of essay topics more closely, and to look at several topics and approaches to the college essay that are compelling. We'll also look at several others that, from our perspective, you should avoid. The only truly essential starting point for your common app essay is that it be about something important to you. It doesn’t need to be about curing cancer, immigrating from Venus to the US or winning three varsity championships in a single morning. It just has to be something significant to you. A good college essay can potentially be about anything. Often times, however, the impulse is to write it about everything: to write an essay about one's philosophy about life, say, or about something equally grandiose. In fact, the better essay strategy may be to start small, by examining the little details in life that nevertheless contain deep meaning. 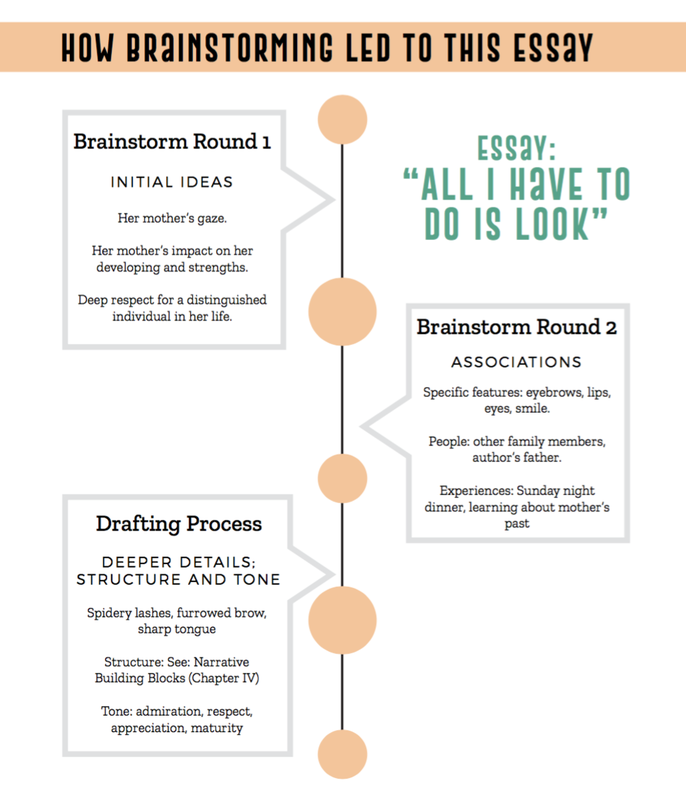 To come up with good topics for your college essay, you'll probably need to do some brainstorming. Keep in mind that the best essays don't spring out of the ground spontaneously, but are the process of a long, typically rigorous process of brainstorming, drafting, and redrafting. But how does one start brainstorming a topic? A good brainstorming session can be the difference between creating a strong and unique essay or a mediocre and predictable one. Remember, a unique topic does not have to be out-of-this-world zany, but simply something that has personal resonance to you. Break up your brainstorming into rounds. In round 1, your goal should be identify the important experiences, people, or periods of time in your life. For specific brainstorming exercises to help you do this, read our blog on brainstorming exercises for the college essay. But for this phase, simply look around and ask yourself, Who or what is most important to me? In round 2, it's time to take your initial list and delve into the sensory and concrete details that surround the characters, times, and experiences that formed your initial list. If you're writing a college essay about your mother, the second phase of your college essay brainstorming should include a list of feelings (love, admiration, respect), settings (her office, the kitchen), etcetera. These will help give you a basic sense of the emotional texture of your essay. Finally, in round 3, it's time to draft. Your objective here is to put the pieces you gathered during rounds 1 & 2 together in a writing process. Start to assemble the pieces of your essay into a narrative that moves beyond the realm of the brainstorm and into the territory of an essay. This can seem a bit abstract or difficult at first. In the next section, we provide an example of a stellar essay, and show you how this process of brainstorming led to its creation. Below, we've included a copy of a college essay that really worked. Read it and try to pick up on the essential themes covered in the essay. Look for what the essay does well, and for where it fails (although, we admit, this essay was pretty great). The section that follows will be dedicated to examining how brainstorming made this essay possible. Her dark brow is often furrowed; the freckles on her tanned nose crinkled as they too scrunch in concentration; the long, spidery lashes of her bright eyes are flickering constantly as she focuses. This is the way my mother calculates, the way she thinks, analyzes, and decides. This is the look I have been raised under, the look to which I can attribute every quirk in my being. It is the look that defines my mother, and the look that has created me. This look—those narrowed eyes, the pursed lips, the sharp tongue—has taught me courage, taught me independence, taught me strength, and sacrifice. They have showed me vulnerability—a flaw in the façade—and isolation. Those features, the way the muscles contract and flex, have instilled in me everything that my mother is and have taught me everything I can be. My mother’s eyebrows taught me independence and determination, a mark left over from her adolescence. Although omitted from my knowledge of her until midway through my seventeenth year, my mother grew up surrounded by temptation and destruction. Alcohol, marijuana, heroin. Tested and abused by her mother, father, sister, and brothers. Jail and violence. Damage and disrepair. My mother was forced to be her own person before she was eighteen; she was forced to be her family’s person, their protector. No matter how she’s suppressed the haunting memories, the twinge in her brow remains the souvenir. It tells me, she tells me, that I don’t need to rely on anyone but myself. She teaches me the importance of taking care of others, but never forgetting to take care of yourself. She taught me courage. It’s not easy to take the first step without a supporting hand. But it is possible. I learned strength from her mouth: her tight lips and the slight smirk. It was the mouth that held in the tears, held back the bitter words, and held up her chin. It was the mouth that kissed me as a child and smiled at my curiosity, despite the divorce, despite the cheating, and the lies. She raised me on her own. She was strong and stubborn. To this day, I don’t understand how she managed to care for infant, maintain a career, pay bills, and never miss Sunday night’s dinner. But the strength that she possessed, that she still possesses despite the heartbreak, the abandonment, and the responsibility. Strength in the face of challenge, strength when there’s nothing to support you—is invaluable. Independence is convenient, and strength endures, but sacrifice is the most powerful of all. And that’s what I see every time I look into my mother’s eyes. The moment she laid eyes on me, the moment she knew she was going to do it alone, she gave me her life. I was the first priority, always. She ensured my safety, she ensured my happiness, my growth, my knowledge, everything. I can never repay her, nor begin to thank for every opportunity she gave me. But I’ll never forget it because I can see it every time she looks at me. The pride or the love or perhaps the occasional eye-rolling. What can have I learned from my mother? How to be myself and how to be better than I am. And I’m always learning, always discovering something new about my mother. And all I have to do is look at her. It’s written there in her features. All I have to do is look. This is a great essay for a number of reasons. The writing is par excellence, and the topic is clearly important and personal. This college essay provides a perfect example of what we mean when we say that an essay doesn't need to be about the time you went to Venus, but can (and should) be about something more ordinary and yet more meaningful. Here, that topic is the writer's mother. But how did brainstorming lead to this essay? Take a look. In Round 1, we can see the initial ideas coming together: Her mother's gaze, her mother's impact on her developing and strengths, and her deep respect for a distinguished individual. These elements form the fundamental idea, if not the actual contents, of the essay. In Round 2, these ideas are deepened through a process of association-building. Specific features attached to sensory details are brought in to deepen the characters in the essay. Finally, a supplementary group of experiences, all mediated through the relationship to the central character, the mother, are introduced. In Round 3 of the brainstorming process, the author introduces concrete details to bring the character and the essay to life. The tone also begins to take shape. While much of the brilliance of the example essay comes in the particular writing ability of the author, the fundamental components have everything to do with a structured and replicable process of brainstorming. All this goes to show that you CAN brainstorm your way into a remarkable college essay. It's just a matter of being deliberate, taking your time, and working carefully to establish the details, characters, and tone that ultimately breathe life into the essay. Although almost any topic can potentially be the basis of a great college essay, there are some we recommend against, for two primary reasons. The topic is overplayed, clichéd, or boring for other reasons. In this section, we list eight types of essay that, for one reason or the other, we advise you to avoid in the process of drafting your college essay. The first variety, the most heinous, is what we've termed "Red Flag Topics." These are essay topics we advise against at all costs, as they have a high chance of either boring or simply alienating admissions committees. Stories that fit into the "Red Flag Topic" section are often so played out that you run the risk of being written off immediately. Here are the three types of essays that we advise againt. Community Service Trips: Applicants tend to draft elaborate essays about short-lived service experiences. These essays may seem condescending or superficial. And besides, who hasn't taken a service trip? We're sure you can think of something else that speaks more eloquently to who you are. The Admissions Process: You won’t win points with admissions by writing about the drudgery of application itself. Your essay is an opportunity to reflect. Believe it or not, you might actually enjoy the process. Unnecessary Quirkiness: Don’t have the reader hold your essay up to a mirror or read in a spiral. Focus on content, not gimmicks. Sports: The advice from admissions officers is simple: don’t write about sports. They’re tired of it. Alternative topics will show additional dimensions of who you are. Leave sports discussion to your short-answer responses or to your list of extracurriculars. There, that was easy, wasn't it? Tempting as those topics may be, do your best to ignore them. Remember, the best essays are written about a seemingly innocuous yet transcendent feature of your life - something that occasions true, deep reflection. That's why service trips aren't a good topic for the college essay: at most, they take place over a week or two, and they rarely get at an experience truly essential to you and your caracter development. Before we proceed to the next section, let's go over a few yellow-flag topics. These are ones that you might want to consider avoiding, but which are not categorically bad. In addition to selecting the best prompt for your essay, it's important to rid your writing of these classic college essay cliches. These pesky phrases, openings, and tendencies are repeated over and over by unknowing students from across the country. These cliches are some of the biggest turn-offs on a college essay, according to college admissions experts. If you identify a cliché in your essay, it just takes some effort and creative thinking to re-design your ideas. THE DICTIONARY OPENING: "Webster's Dictionary defines ‘determination’ as..."
THE VAGUE GOAL: "I've always known, from the time I was old enough to play Operation, that I wanted to be a doctor." Avoid all these cliches and you should be off to a good start. Of course, this list isn't exhaustive; to look for your own cliches, just read your essay with an eye for banalities, common phrases, and ideas that seem superficial or common-hand. A good rule of thumb is that "If you've heard it before, take a second look." This topic is just too massive to cover in this post. That's why we've written an entire blog post dedicated to the topic for you to check out. The post includes three examples of essays that really worked, and that are also amazing examples of how to write an effective college essay. For more advice about how to avoid cliché in your college essays, take a look here. As you begin to write your college, essay, whether you're starting off brainstorming or you already have a draft in the works, remember: a good college essay is vulnerable and comes from the heart. That advice can be a dime-a-dozen - what does it really mean to write an essay that "comes from the heart" and is "vulnerable"? In this guide, we hope that we've provided some answers to that question. To us, the best college essays are those which begin from a place close to the applicant's daily life, and which illuminate something special yet simple. Remember, you don't need to come across as a superstar, a profound mind, or a saint in order to impress an admissions committee. All you need to do is be honest - both with them and with yourself - in the portrait you construct of your life. Sometimes, clichés are clichés for a reason: because they're true. The cliché "everyone has a story to tell" just happens to be one of these. If you're looking for more exercises and information on the process of writing the college essay, we invite you to download our free guide. It includes more examples of successful college essays, as well as more detailed brainstorming exercises. Check out our guide and other resources here. If there's a specific question you'd like to have answered that wasn't covered in this guide, don't hesitate to reach out. We're always happy to answer any questions you might have. Looking for News from North Coast? Sign up for resources, goodies and insight. Come Visit us in San Rafael! Our office is located at 1005 A st, directly above the Starbucks on 4th avenue.